The magic food bowl came out this morning and was filled with tasty morsels that our second mate could smell but not reach until 6pm. This meant one thing, we’d be away for the night. Our personal taxi arrived late morning with Bridget (of NB Blackbird) at the wheel. We were being whisked away for a night on dry land at their now not so new house. Tilly was left in charge with the boiler running off the electric to keep the chill off. Now dry land, sadly for all of us it wasn’t. Following Storm Freya the weather has been decidedly wet. Not good for us due to rivers rising and not good for Bridget and Storm as they are needing to get a wall built in their garden to hold back the rest of it. The trench that had been dug for concrete has now turned into a moat. Plenty of catching up to do as we’ve not seen them since they put NB Blackbird on the market back in August at Crick. 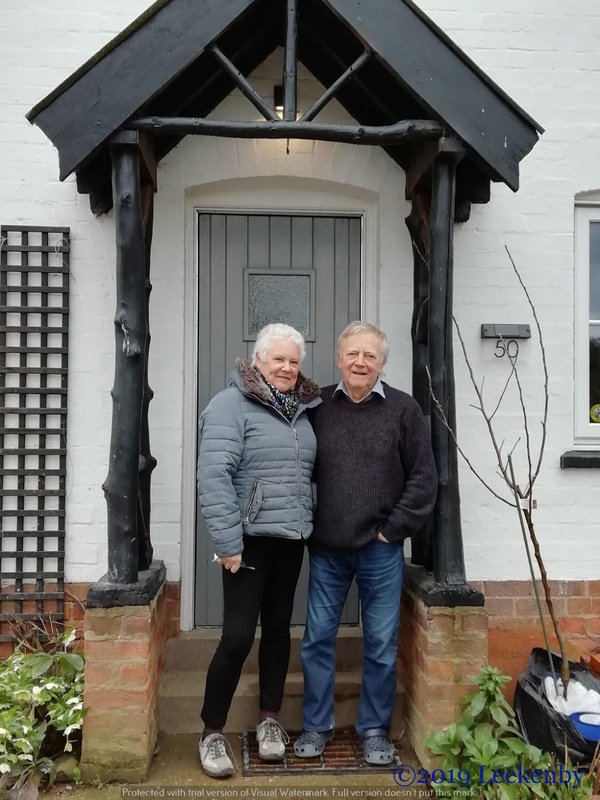 A guided tour of their house which has had major works done to it and is a lovely home. We can see why they love it so much. 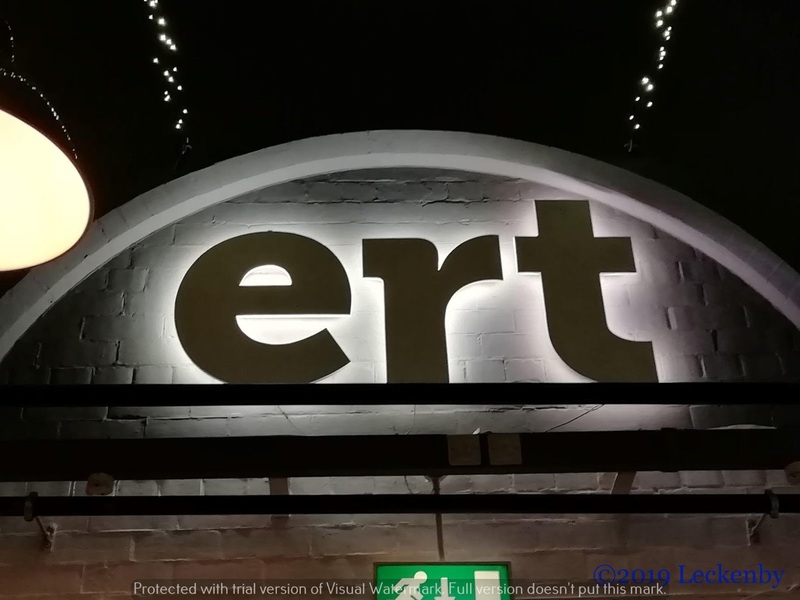 The afternoon disappeared quickly then it was time to head out to the theatre to ERT. East Riding Theatre is in Beverley, a professional theatre run by volunteers. We were here to see the preview performance of ‘I Want That Hair’ by Jane Thornton, directed by John Godber (John Godber Company). 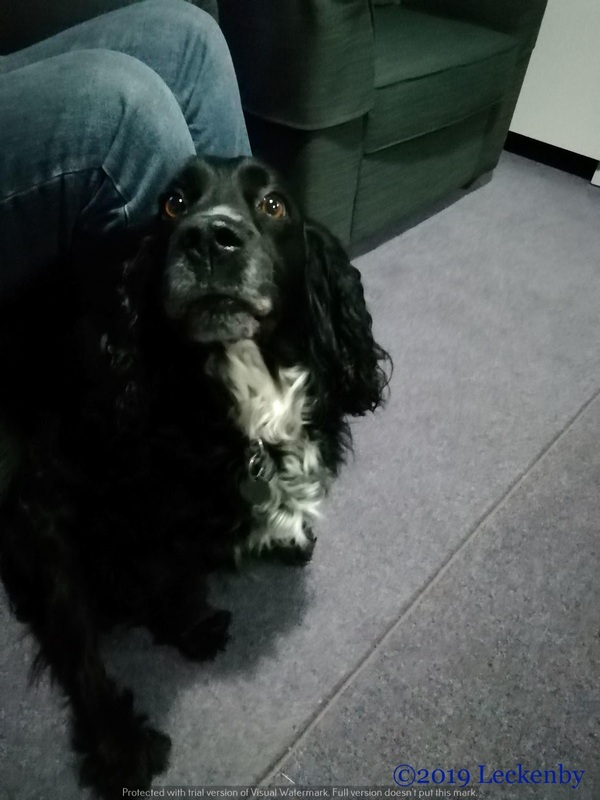 I designed the premiere production for Hull Truck back in 2006 which then went on tour, Bridget booked the tour which included finding digs for an actress who insisted on touring with her dog, not an easy feet. The evening felt very much like we were back in our Trucking days. John and Jane in an old building re-purposed into a theatre. Minimum staff, two actors I’ve worked with on various occasions at Hull Truck. The set ( designed and built by my friend Graham Kirk) was one that if you’d taken the top two foot off would have fitted onto the old stage at Spring Street. Two very good performances from Jackie and Pippa. The only difference was the number in the audience, sadly not many. However at the weekend it looks like the seats will be full of people laughing away the evening. We got chance to catch up with John and Jane after the show. They start rehearsals next week for ‘Scary Bikers’ which will be playing at Trafalgar Studios in London for most of April. We saw the show last year in Bromsgrove and thoroughly enjoyed it. Hope they have a good run, just a shame it means they are too busy to come to visit us on the boat whilst we’re close by. Thursday morning we woke up to a different view whilst we enjoyed our cuppa in bed. Just out of sight behind a small hill is the A1079 which leads to York or Hull. 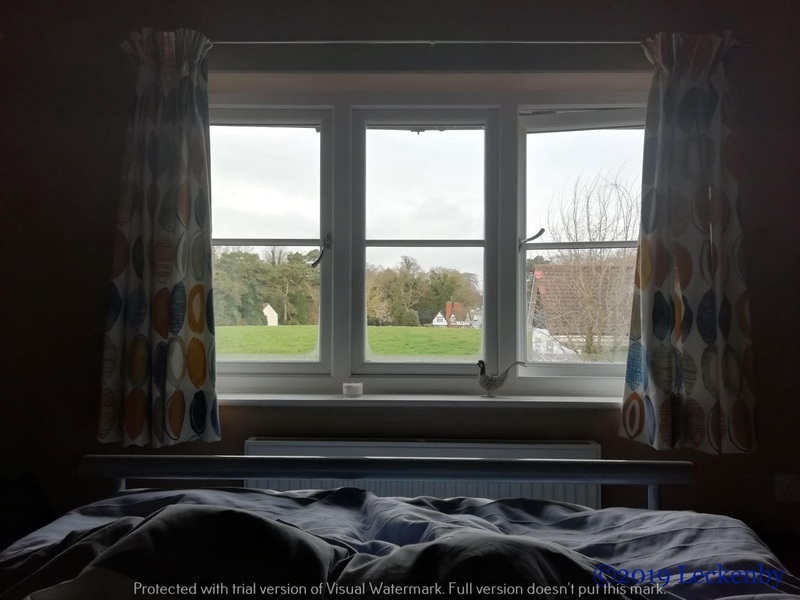 Bird song and countryside with good road connections. 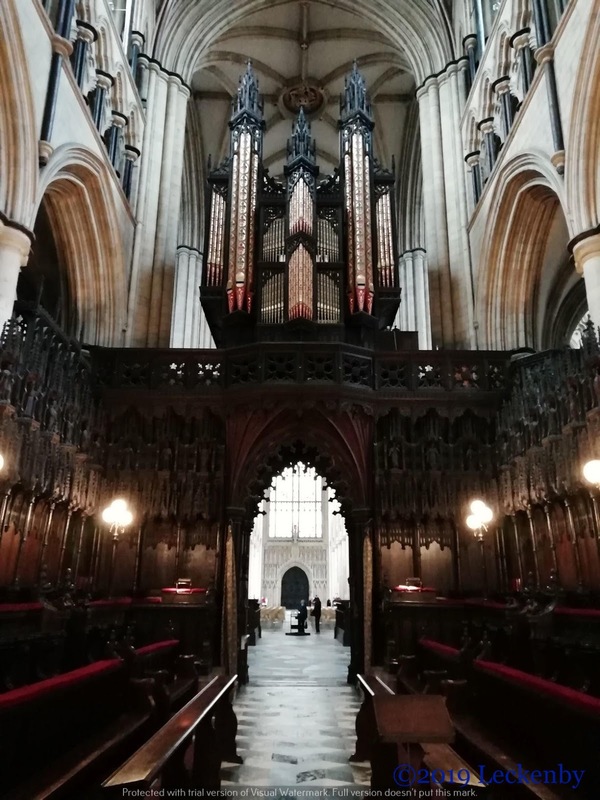 After a very good cooked breakfast, Bridget gave us a ride into Beverley and we spent some time looking around the Minster. I’ve driven past numerous times but never been inside and it was a suitable place to avoid the constant rain. 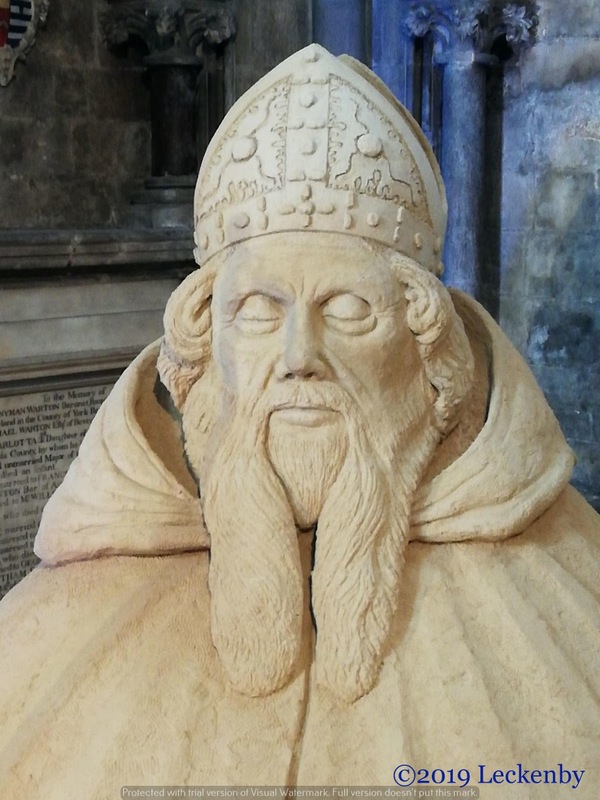 John, Bishop of York first founded a christian community in Beverley. 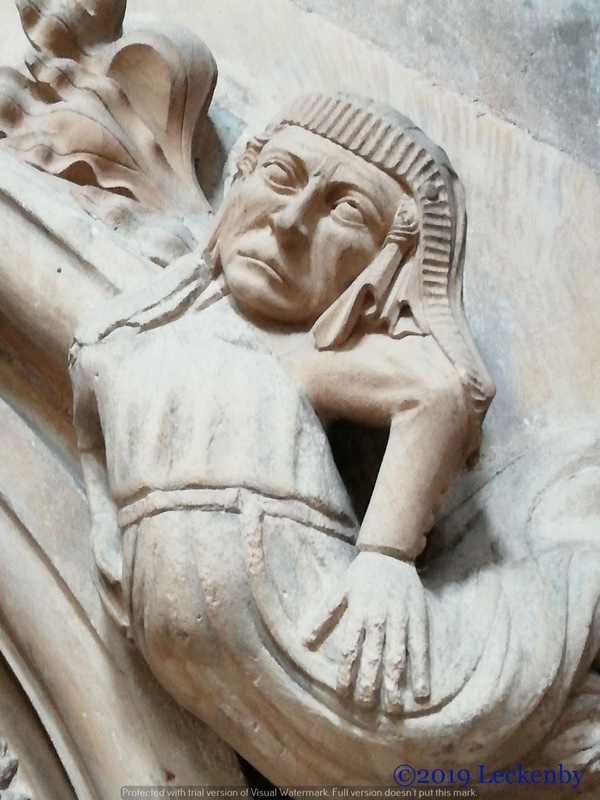 A Norman church was built on the site followed by the present Gothic church, the former being dismantled as the new church was being built. 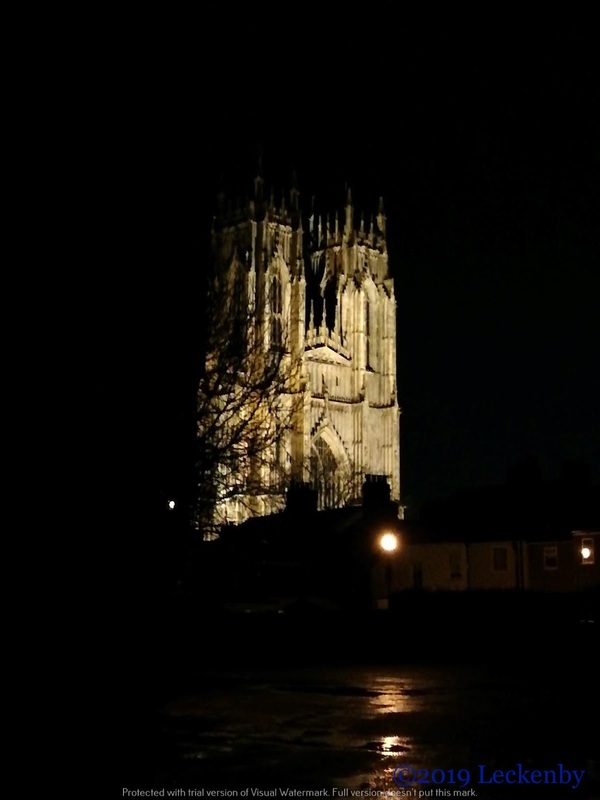 The Minster was reduced to the status of a parish church after 1548 when it ceased to be a Roman Catholic church. Maintenance of the building was neglected for many years, but its collapse has been prevented by numerous restorations since the 18th century. 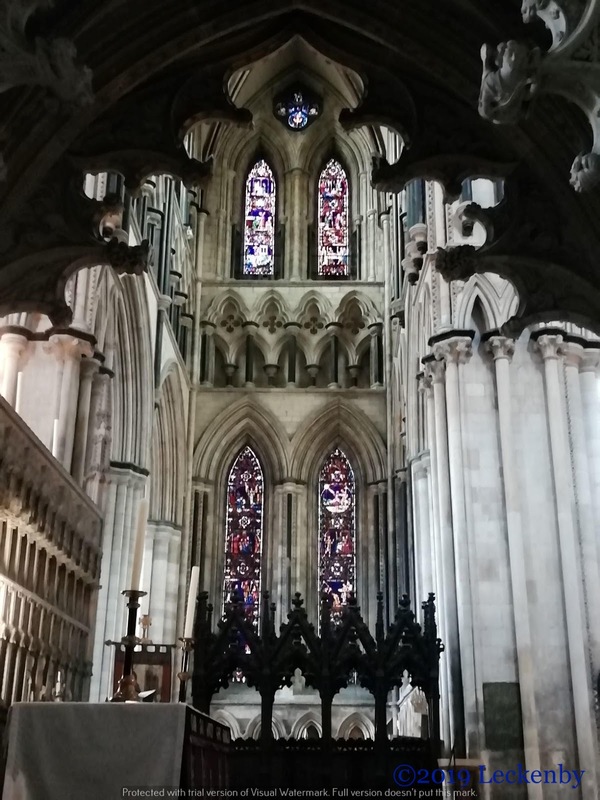 At one point the north transept wall was leaning outwards by 4ft. This was carefully moved back to the vertical by using a wooden cradle on both sides of it. The bottom was cut and it’s connection to ceilings and internal walls were severed. This meant that the wall could be see-sawed back into position. A column still shows the angle to which the building had reached. In the south transept is a WW1 memorial to the East Yorkshire Regiment. Illuminated scrolls bear the names of those who died. 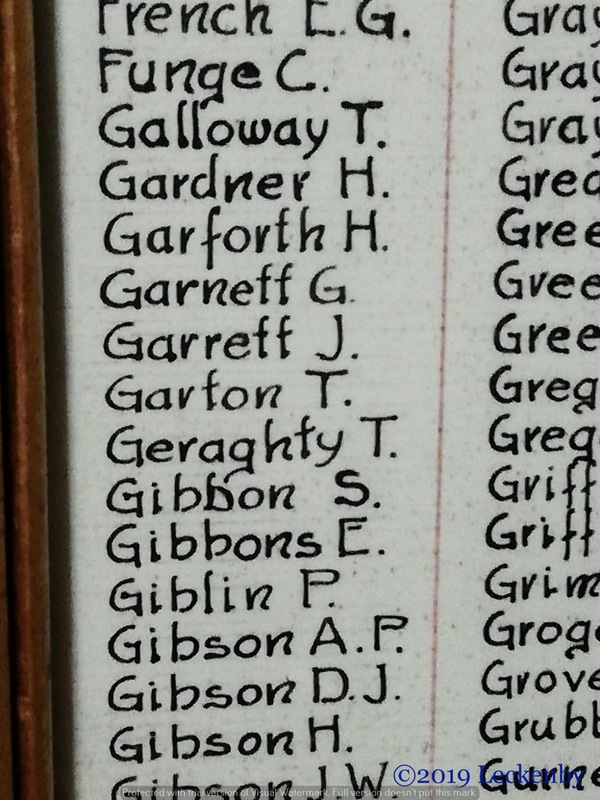 Amongst the list we found two entries for Geraghty T. Mick is a Geraghty and his family come from Hessle close by. Tom Geraghty, Mick’s grandfather served in the regiment, but was neither of these men as he survived the war. 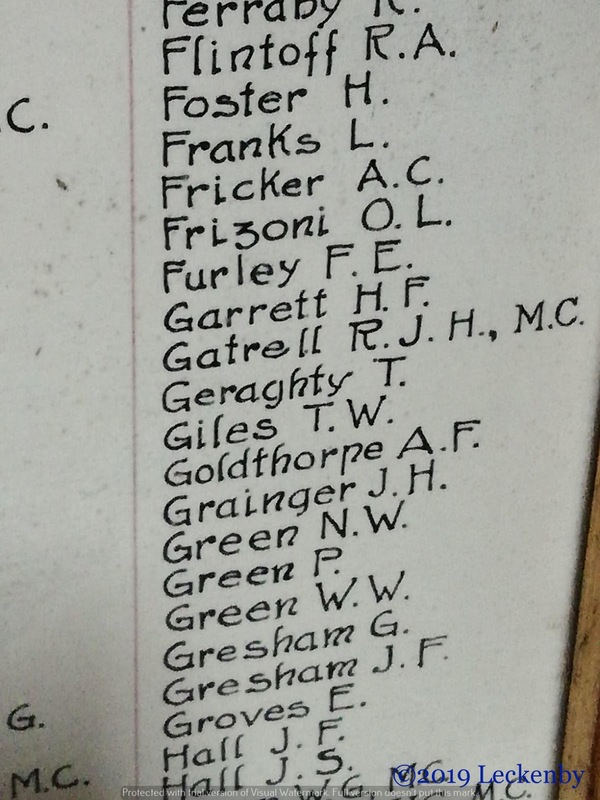 We may have to do a bit of research to see if we can find out if these two chaps were relatives. Bridget picked us up again to return to the house where parcels had arrived for us with new boat shoes. I’ve gone for slightly less trainer looking shoes for winter and Mick’s are more summery. We like the grips on the Shoes for crews shoes as they are the best non-slip we’ve come across. After lunch it was time for us to return to check on Tilly. We’d planned on moving out of the marina in the afternoon, but it was peeing it down and the wind was blowing a hoolie so we decided to stump up another £10 to stay another night, the weather should be better tomorrow. The River Ouse level with it’s banks in York at 3:45 today! PS that narrowboat ran away soon after. With all this rain and the forecast not improving much for the next few days our trip to York may not be possible. At the moment just getting to Selby would be hard enough with the River Aire having risen. 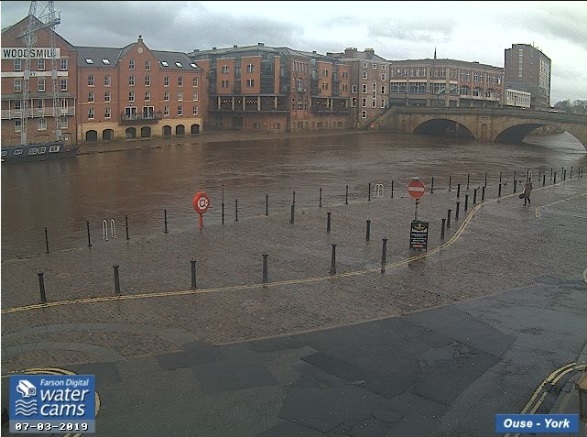 Water levels and web cams are being watched, if the level in the centre of York remains high then our booking for the tidal Ouse next week will be cancelled. 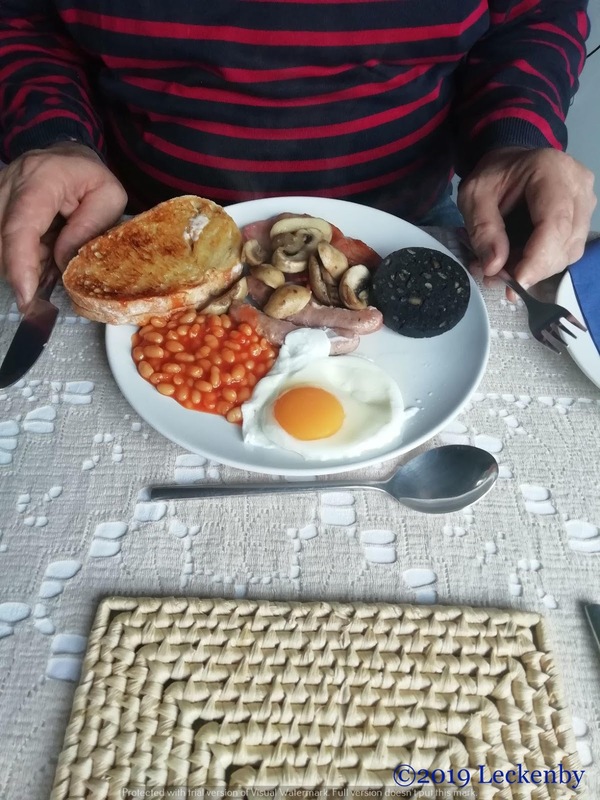 0 locks, 0 miles, 2 ex-boaters, 1 happy woofer, 1 cat home alone, 1 play, B1g1f, 2 actors, 1 writer, 1 director, 2 very wet days, 1 cliff, 1 moat, 2 rivers on the rise, 1 sock enquiry, 6 sketches chosen, 2 for further work, 1 cooked breakfast, 2 lovely days with Bridget and Storm, 1 big Thank You. 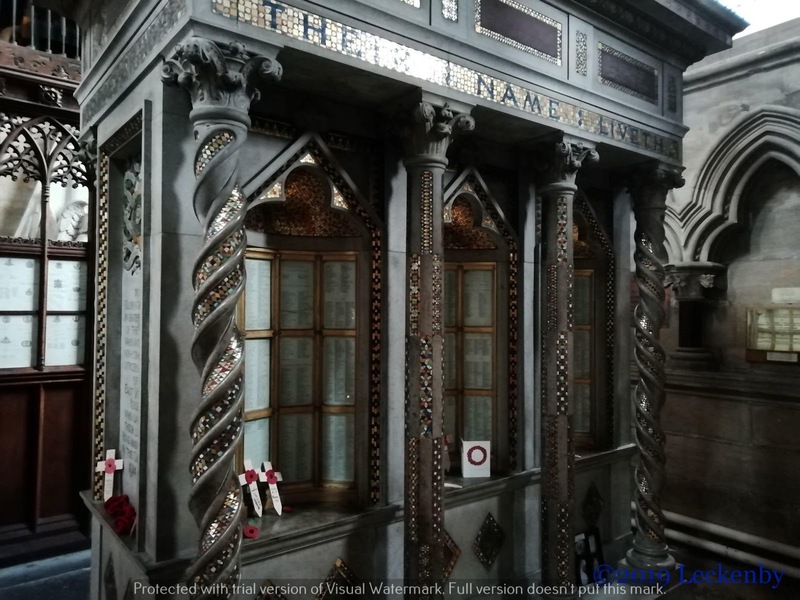 This entry was posted in Uncategorized on 9th Mar 2019 by pipandmick.